Valves are linear with parallel or slightly convex sides, although smaller valves may be more linear-elliptical in shape. Apices are slightly rostrate to bluntly rounded. A single rimoportula is present on one or both poles, in line with a stria. 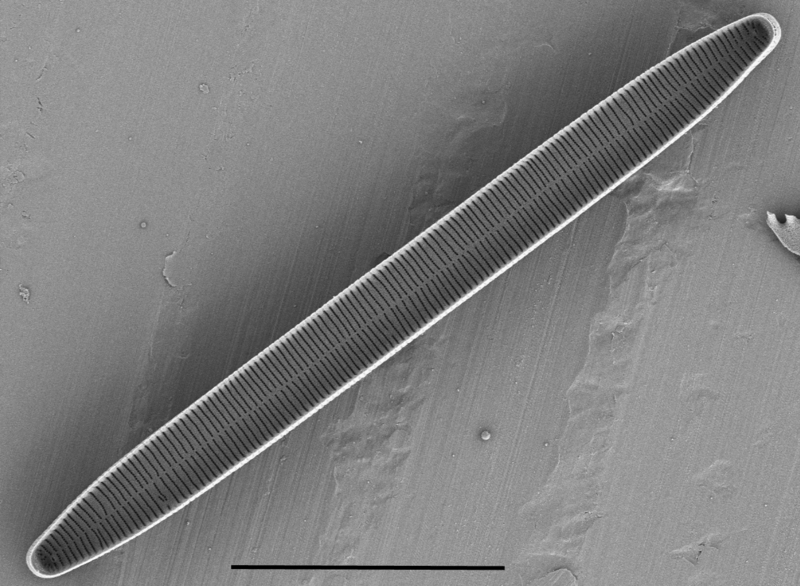 Striae are parallel throughout most of the valve, but may be slightly radiate towards the ends. Valves typically have 20-21 striae in 10 µm, but the range is 18-25 in 10 µm. Striae are fine, extend around the margin of the valve onto the valve mantle. A very narrow sternum is present along the apical axis of the valve. 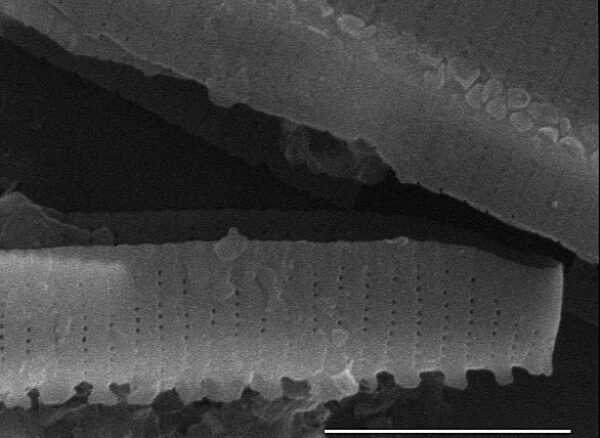 The striae on either side of the sternum are slightly offset or alternate (SEM). 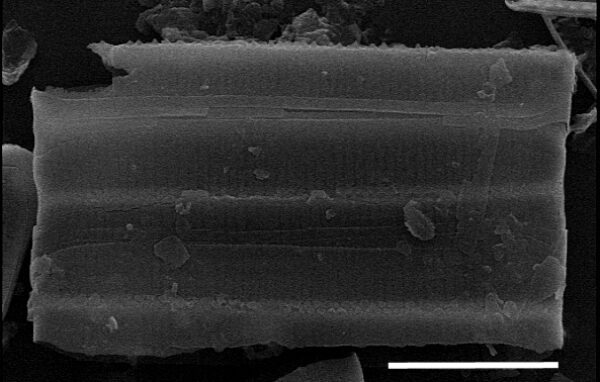 There is a small apical pore field present at each pole. Frustules form colonies and are observed as rectangular bands in girdle view. Short spines on the margin of the valve are often seen in girdle view. 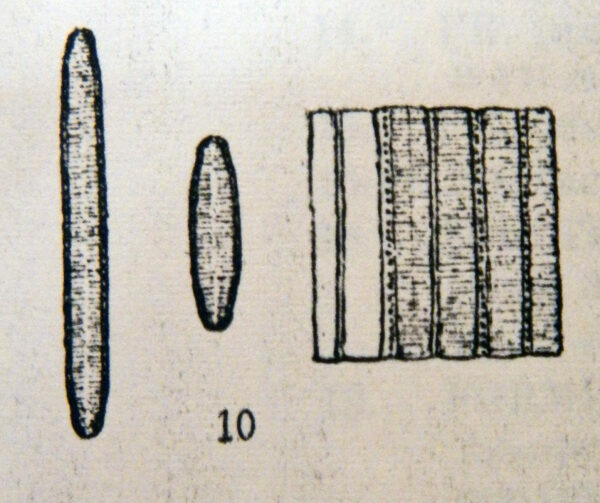 The short spines are flat and slightly rounded (spatulate). In girdle view, 2-3 copulae may also be visible on each frustule. 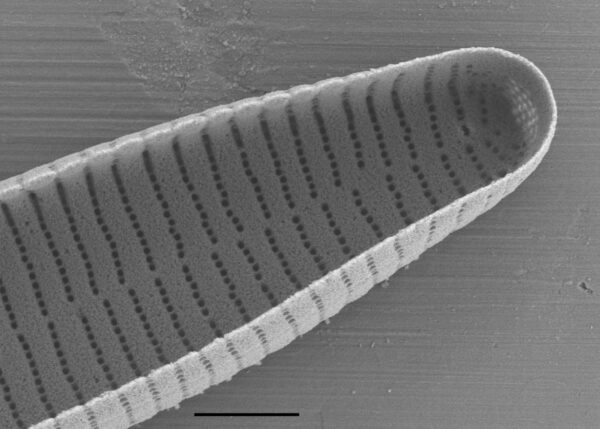 Internal valves are common in specimens from ephemeral habitats. Note that the transfer of Fragilaria nitzschoides Grunow in Van Heurck was made to Fragilariforma nitzschiodes (Grunow) Lange-Bertalot (Hofmann et al. 2011), but not used in that flora. 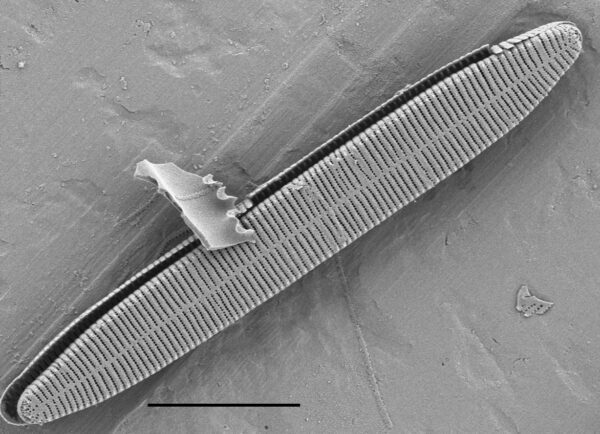 Fragilariforma nitzschioides forms colonies where individual cells are held together by small linking spines and small mucilage pads produced at the apical pore fields of each valve (Round et al, 1990). 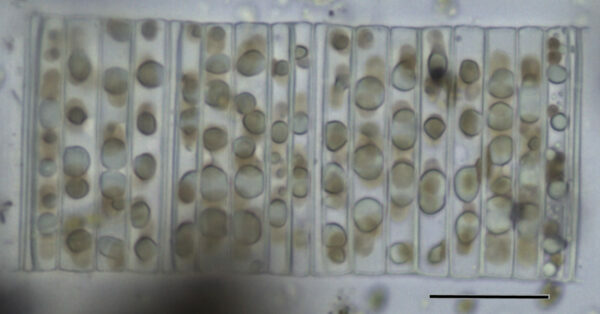 In live colonies, chloroplasts are numerous, small, discoid, and are either scattered throughout the cell or gathered into the center of the cell. It is abundant in samples collected from the Cayler Prairie pothole in Dickinson Co., Iowa. Live samples were collected from the outflow stream in the marshy area located within the pothole. The prairie pothole experiences both wet and dry periods throughout the year, and numerous F. nitzschioides internal valves are observed in samples of detrital thatch from the marsh and outflow stream. Internal valves are valves that are not part of the regular division of the cell and only one functional valve is produced during mitosis (Round et al, 1990). 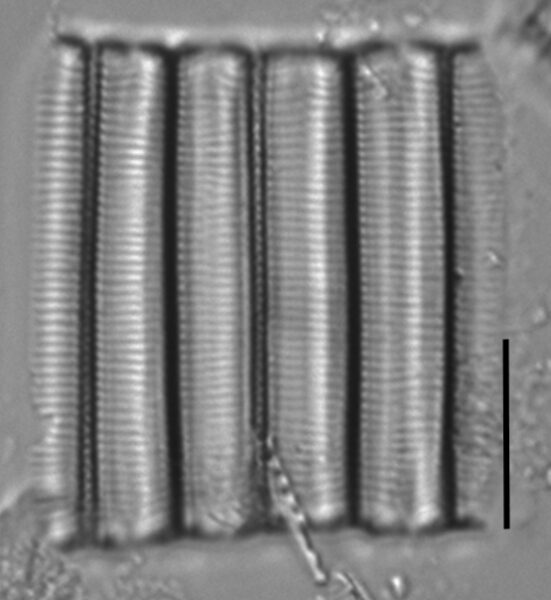 Internal valves are common in taxa living in subaerial or saline habitats, and are also associated with dormancy in some taxa (Round et al., 1990). Fossil F. nitzschioides colonies (chains of 10-15 individuals) have been reported in the 602,000 year old Lava Creek B Ash deposit (Yellowstone Caldera eruption) in Smithville, Texas. The autecological preferences of the diatom assemblage (both planktonic and benthic taxa) in the ashfall deposit suggests these taxa were living in a cool, alkaline, moderate to high conductivity, slow-flowing stream or lake (Winsborough, 2000). 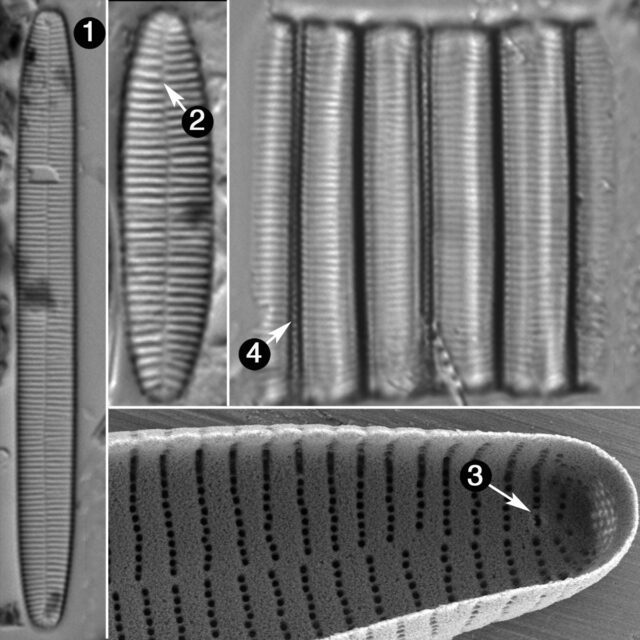 Hofmann, G., Werum, M. and Lange-Bertalot, H. (2011) Diatomeen im Süßwasser-Benthos von Mitteleuropa. Koeltz Scientific Books, Königstein, 908 pp. Williams, D.M. and Round, F.E. (1987) Revision of the genus Synedra Ehrenb. 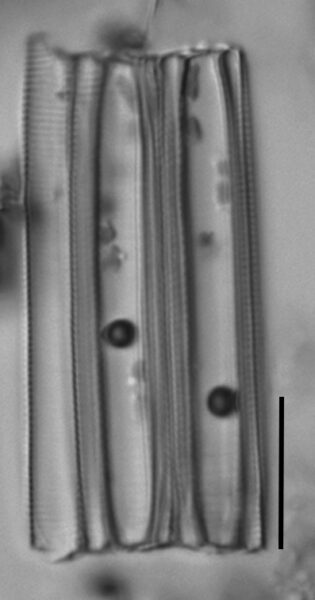 Diatom Research 1(2): 313-339. Valves are linear with slightly rostrate to bluntly rounded apices. The sternum is very narrow. A rimoportula are present at one or both poles, which is visible in many specimens in LM. Short linking spines are most visible in frustules in girdle view.